I spent the week in a beachfront hotel in Paphos, on the western edge of the island. By the end of the week, after a busy ESPON meeting on the EU’s Neighbourhood, I was able to squeeze a bit of time to see some of the local sights and sites, and gain more understanding of the place I was in. To begin at the beginning, Paphos has a rich heritage. The Tombs of the Kings date from the fourth century BC, though settlement here goes back even earlier, to the Neolithic Age. Behind the harbour and its medieval fort is the Archaeological Park. 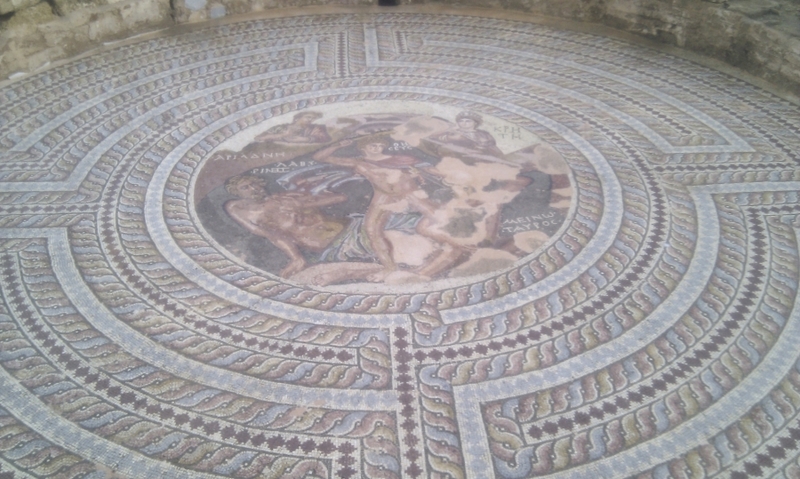 In this World Heritage Site I saw remarkably well-preserved and impressive mosaic floors from villas that date from the third to the fifth century AD. The mosaics mainly show scenes from Greek mythology. Up the coast you’ll find the Baths of Aphrodite – the name alone is irresistible. In the Ancient World, this part of Cyprus was to devotees of the cult of Aphrodite what Mecca is today to Muslims. In short, this really is a place that matters in terms of the cultures of Europe. Add in the mountainous landscape inland, a geological mixture that creates biodiversity, and the dazzling blue sea and high number of sunny days and you have a significant store of territorial capital. Despite this, Paphos remained a relatively poor place for a long time. The inland villages were the home of small farmers struggling to make a living from the rough terrain. British colonial occupation saw a steady decline as people moved to larger urban centres in more developed parts of the island. While agriculture remains dominant across much of inland Cyprus, on the coast the advent of mass tourism reversed these trends. Resorts were built, ex-pat’s invested in property, an international airport was constructed, population grew and the city spread. Farms were built on, land was sealed. Retail, restaurants and bars came to dominate in the tourist trap area around the harbour. Meanwhile the retail boom also saw the construction of one shopping centre after another along the main highway connecting the town to the island’s motorway network. New villagers arrived from London, Munich or Moscow to convert a farmhouse or build their villas on the hill slopes that catch the sun and command wonderful views to the blue sea, beyond the brilliant magenta, orange or white bougainvillea, and the shady lemon and pomegranate trees. There were deals to be done and local plans to be negotiated. Sometimes the best site was not chosen. I saw one area where land zoned for housing, after enthusiastic advocacy by the local mayor, who also happened to be the landowner, was on steeply sloping clay. Those who built or bought there now find that the roads are buckled; cracks appear in walls as their houses slide slowly but surely down towards the city below. Across the Mediterranean issues of governance are intertwined with the financial crisis. Less people are coming to the resorts, more ex-pats seek to sell their holiday homes, banks want money and won’t loan. Half-completed resort hotels stand mothballed, though construction is continuing on some sites. There are few cars in the cavernous parking areas beneath shopping centres in which few checkouts are staffed, even at peak shopping times. There is a sense that the local planning system has not adapted yet to this transformation. Plans made before the crisis still provide the statutory base for decisions, regulating development that has evaporated. More targeted regeneration interventions are probably needed. The most notable of such initiatives is the successful bid by Paphos for European City of Culture 2017, a title that it will share with Aarhus in Denmark. The bid was put together with help from German consultants and takes inspiration from the success of Essen in winning the accolade, despite being a city historically characterised by heavy industry rather than high culture. Nevertheless, the concept of Paphos City of Culture as “The Open Air Factory” jars somewhat in a place that has no real industrial manufacturing tradition. For more on this see my blog for the Innovation Circle site. Looking to the future, what development strategy might Paphos and Cyprus follow? Geographically, and following the theme of last week’s blog about EU Neighbourhood Policy, it can be the gateway to Europe for the Middle East. However, how far does propinquity define development opportunities today? The border with the Middle East is probably the most problematic in the EU. It is a water not a land border, with a volatile region of states with sharp internal and external regional and ethnic differences, and it is a geo-region in which the Gulf States provide serious competition to the EU in terms of trade and network access. One interesting point made by the ESPON ESaTDOR project is that only 20% of shipping that passes through the Mediterranean actually stops there. Basically the sea is a “tunnel” – places adjoining it get the problems generated by the traffic passing through (e.g. oil spill risk) but few development benefits. Cyprus as an island economy also has a challenge in terms of the relatively small home market, and the transport costs of exporting. Looking at an industrial estate in Paphos it seemed like most of the firms there were serving the local construction industry. While anecdotal, this observation gives some indication of the way the crisis must be impacting through the different sectors in the local economy. Meanwhile the government of Cyprus has aspirations to diversify the tourism offer, and is looking at the potential offered by higher market, more specialised forms of tourism. Islands are inherently vulnerable in terms of supplies of essential materials. This is one reason why the EU has recognised their special situation in terms of policy for territorial cohesion. Like much of south-east Europe, Cyprus is dependent on energy supplies from Russia, though it must have considerable potential for solar energy in the future. More worrying is its need for water, which is vital for irrigation as well as for the seasonal boom in tourists. At times water has been imported in tankers from Greece. Water resources in mountain areas of the island – the rural sub-regions that Cyprus rather turned its back on during the development boom – will become increasingly important. Proactive strategic planning is going to be needed to ensure future supplies, not least in the context of climate change which is likely to see increasing heat and aridity in this region. In summary, there are no easy answers, but what is clear is that planners need to think both at the global and the local scale to negotiate a way to recovery and a more sustainable future. It is difficult for any small island state (see, for example my previous blogs on the Maldives and on Brunei). Perhaps the most fundamental message is that sophisticated and transparent governance is essential, and effectiive strategic and local planning have to be a key part of that. This blog was first posted on the Planning Resource website on 11 December 2012. Is Airbnb a threat to historic cities and towns? One Belt One Road - spatial planning at global scale?